Honokiol is a lignan present in the cones, bark, and leaves of Magnolia grandiflora that has shown pro-apoptotic effects in melanoma, sarcoma, myeloma, leukemia, bladder, lung, prostate, oral squamous cell carcinoma and colon cancer cell lines. SL-327 is a selective inhibitor of MEK1 and MEK2 (IC50 values are 0.18 and 0.22 μM respectively); blocks hippocampal LTP in vitro. Brain penetrant in vivo, blocking fear conditioning and learning in rats, and producing neuroprotection in mice, following systemic administration. Refametinib is a potent, ATP non-competitive and highly selective inhibitor of MEK1 and MEK2 with IC50 of 19 nM and 47 nM, respectively. Cobimetinib is a potent, highly selective inhibitor of MEK1/2. Cobimetinib R-enantiomer is the R-enantiomer of Cobimetinib, which is a potent, highly selective inhibitor of mitogen-activated protein kinase kinase(MEK1/2). MEK inhibitor is a potent MEK inhibitor, antitumor agent. BI-847325 is an orally bioavailable, and selective dual MEK/Aurora kinase inhibitor with IC50 of 3 nM, 25 nM, 15 nM, 25 nM, and 4 nM for Xenopus laevis Aurora B, human Aurora A and Aurora C, as well as human MEK1 and MEK2, respectively. Phase 1. G-479 is an potent MEK inhibitor. G-479 with polarity distributed throughout the molecule was shown improved bioactivity over GDC-0623 in many aspects. GDC-0623 is a potent and ATP-uncompetitive MEK1 inhibitor with Ki of 0.13 nM. Phase 1. PD 198306 is a potent, selective and non-ATP competitive MAPK/ERK-kinase (MEK) inhibitor. PD 334581 is used in biological studies to evaluate halogen bonding as a novel interaction for rational drug design. It is also an inhibitor of MEK1. AZD6244 (Selumetinib) also known as Selumetinib, ARRY142886, AZD-6244 & ARRY-142886 is MEK 1/2 inhibitor with GI50 values ranging from 14 to 50 nm. PD98059 is an equipotent antagonist of the aryl hydrocarbon receptor and inhibitor of mitogen-activated protein kinase kinase. PD184352 (CI-1040) is an ATP non-competitive MEK1/2 inhibitor with IC50 of 17 nM in cell-based assays, 100-fold more selective for MEK1/2 than MEK5. Phase 2. U0126-EtOH is an inhibitor of both MEK1 and MEK2 with an IC50 of 72 nM and 58 nM respectively. AS703026 is a novel, selective, orally bioavailable MEK1/2 inhibitor that inhibits growth and survival of MM cells and cytokine-induced osteoclast differentiation. GSK1120212 (JTP-74057) strongly prevented the activities of MEK1 and MEK2 kinases rather than activities of other 98 kinases. BIX 02189 is a selective dual MEK5 and ERK5 (or BMK1) kinase inhibitor, with IC50 values of 1.5, 59, 580 and >6200 nM for MEK5, ERK5, TGFbR1 and other closely related kinases respectively. TAK-733 is an orally bioavailable small-molecule inhibitor of MEK1 and MEK2 (MEK1/2) with potential antineoplastic activity. AZD8330 is a novel, selective, non-ATP competitive MEK 1/2 inhibitor with IC50 of 7 nM. Phase 1. PD318088 is an inhibitor of MEK1 AND MEK2. BIX02188 is a potent and selective inhibitor of MEK5. 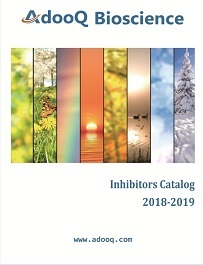 Cobimetinib (GDC-0973, RG7420) is a potent and highly selective MEK1 inhibitor with IC50 of 4.2 nM, showing more than 100-fold selectively for MEK1 over MEK2 and showed no significant inhibition when tested against a panel of more than 100 of serine-threonine and tyrosine kinases. MEK162 (ARRY-438162) is a potent, selective, ATP uncompetitive inhibitor of MEK1/2. Refametinib, also known as RDEA119, BAY 86-9766, is an orally bioavailable selective MEK inhibitor with potential antineoplastic activity. Estelle Daudigeos-Dubus, etc. Regorafenib: Antitumor Activity upon Mono and Combination Therapy in Preclinical Pediatric Malignancy Models. PLoS One. 2015; 10(11): e0142612. Balamapimod, also known as MKI-822, is a Ras/Raf/MEK inhibitor. Hypothemycin is a resorcylic acid lactone polyketide. It was found to inhibit the proliferation of mouse and human T cells stimulated with anti-CD3 mAb + PMA and of human PBMC stimulated with anti-CD3 mAb alone. RO4987655 is an orally active small molecule, targeting mitogen-activated protein kinase kinase 1 (MAP2K1 or MEK1), with potential antineoplastic activity. The activity of Pluripotin (SC-1) is mediated by the combined inhibition of RasGAP and ERK1 with Kd values of 98 and 212 nM, respectively. VRT752271 is a pyrrole inhibitors of ERK protein kinase. SCH772984 is a novel, specific inhibitor of ERK1/2 with IC50 of 4 nM and 1 nM, respectively. TCS ERK 11e (VX-11e) is a potent and selective extracellular signal-related kinase 2 (ERK2) inhibitor (Ki values are <2, 395, 540 and 852 nM for ERK2, GSK-3, Aurora Kinase A and Cdk2 respectively). Potently blocks proliferation of HT29 cells (IC50 = 48 nM). Qi-sang Guo, etc. Involvement of FAK-ERK2 signaling pathway in CKAP2-induced proliferation and motility in cervical carcinoma cell lines. Sci Rep. 2017; 7: 2117. GDC-0994 is a potent and selective Erk1/2 inhibitor. GDC-0994 inhibits both ERK phosphorylation and activation of ERK-mediated signal transduction pathways. XMD17-109 is a novel, specific inhibitor of ERK-5 with an EC50 value of 4.2 uM in HEK293 cells. FR 180204 is a novel and selective inhibitor of extracellular signal-regulated kinase (ERK), which may be a potential new therapy for rheumatoid arthritis. XMD8-92 is a potent and selective BMK1/ERK5 inhibitor . MCB has been shown to inhibit both casein kinase 2 (CK2) and extracellular-signal-regulated kinase 8 (ERK8/MAPK15) (IC50 = 0.50 uM for both CK2 and ERK8). DEL-22379 is a potent and selective ERK Dimerization inhibitor that inhibits ERK Dimerization without affecting ERK phosphorylation, forestalls tumorigenesis driven by RAS-ERK pathway oncogenes. APS-2-79 is an antagonist of MEK phosphorylation by RAF through direct binding of the KSR active site. ERK5-IN-1 exhibits potent inhibition of ERK5 with cellular EC50 values of 0.19 uM and enzymatic IC50 values of 0.087 uM and of LRRK2[G2019S] with enzymatic IC50 values of 0.026uM. Tomatidine inhibits the phosphorylation of ERK, Akt, and the nuclear content of NF-kB. possess anti-inflammatory properties. SB-242235 is a potent and selective p38 MAP kinase inhibitor that may be an effective therapy for cytokine-mediated diseases such as autoimmune or inflammatory diseases. RWJ-67657 is a potent p38 MAPK inhibitor. BMS-582949 Is a Dual Action p38 Kinase Inhibitor Well Suited To Avoid Resistance Mechanisms That Increase p38 Activation in Cells. Pexmetinib is a potent inhibitor of cytokine synthesis, via the dual inhibition of p38 mitogen-activated protein kinase (MAPK), and Tie2/Tek receptor tyrosine kinase. AMG 548 is a potent and selective inhibitor of p38α. It displays >1000-fold selectivity against 36 other kinases, and it inhibits whole blood LPS-stimulated TNFα. SKF 86002 Dihydrochloride is inhibitor of p38 MAP kinase (IC50 = 0.1 - 1 uM). Potently inhibits LPS-induced IL-1 and TNF-α production in human monocytes (IC50 = 1 uM).